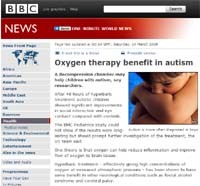 Hyperbaric Oxygen Therapy - World News Coverage | Autism, Cancer, Injuries and More! Information within this page is provided for informational and educational purposes only. This information is not meant to substitute for the advice provided by your personal physician or any other medical professional. You should not use the information contained herein for diagnosing or treating a health problem or disease, or prescribing any medication. If you have or suspect that you have a medical problem, promptly contact your health care provider. 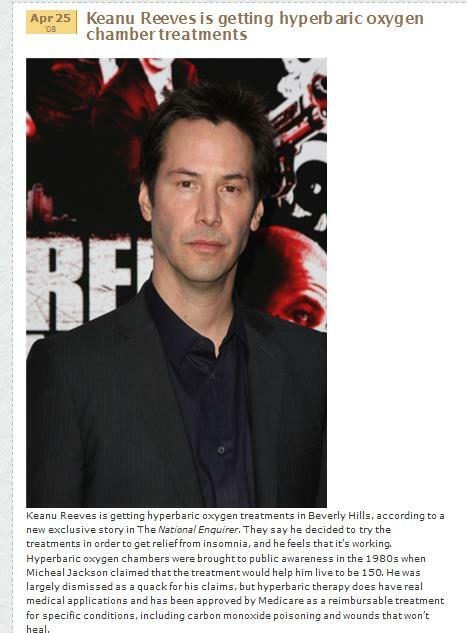 Hyperbaric oxygen therapy saves young girl's toe (Dec 22, 2009). Click Here. Hyperbaric Oxygen Study Shows Potential Benefit for Patients With Traumatic Brain Injury. Click Here. U.S Air Force: Hyperbaric chamber team to study traumatic-brain-injury treatment (11/14/2008). Click Here. Although hyperbaric oxygen has been shown to enhance the efficacy of radiotherapy and chemotherapy for the treatment of several malignant tumors, the impact of hyperbaric oxygen on osteosarcoma has not yet been demonstrated. In this study, we investigated the efficacy of hyperbaric oxygen alone and in combination with an anti-cancer drug as an adjuvant to chemotherapy. In vitro, highly metastatic murine osteosarcoma cell lines were exposed to hyperbaric oxygen and cell viability was examined. Hyperbaric oxygen alone significantly suppressed cell proliferation, and hyperbaric oxygen plus carboplatin exhibited significant synergism in suppression of cell proliferation. In vivo, C3H mice were subcutaneously inoculated with osteosarcoma cells and divided into four groups: control, hyperbaric oxygen, carboplatin, and carboplatin plus hyperbaric oxygen. After 5 weeks, increase in both tumor volume and number of lung metastases was significantly suppressed in the hyperbaric oxygen group. Concomitant hyperbaric oxygen clearly enhanced the chemotherapeutic effects of carboplatin on both tumor growth and lung metastasis in osteosarcoma-bearing mice. Moreover, mortality in the carboplatin plus hyperbaric oxygen group was significantly lower than in the other three groups. These findings suggest that hyperbaric oxygen plus carboplatin combination therapy could be an appropriate therapeutic regimen for the treatment of patients with osteosarcoma. A decompression chamber may help children with autism, say researchers. After 40 hours of hyperbaric treatment autistic children showed significant improvements in social interaction and eye contact compared with controls. The BMC Pediatrics study could not show if the results were long-lasting but should prompt further investigation of the treatment, the US team said. One theory is that oxygen can help reduce inflammation and improve flow of oxygen to brain tissue. Hyperbaric treatment - effectively giving high concentrations of oxygen at increased atmospheric pressure - has been shown to have some benefit in other neurological conditions such as foetal alcohol syndrome and cerebral palsy. Some studies have looked at the treatment in children with autism but they have not compared with a dummy procedure raising questions around a "placebo effect". In the latest study, carried out at six centres in the US, 62 children aged two to seven with autism were randomly assigned to receive 40 hours of treatment over a month with 24% oxygen at increased atmospheric pressure (1.3 atm) or normal air in a slightly pressurised room (1.03 atm). Children who received the treatment showed significant improvements in overall functioning, receptive language, social interaction, eye contact, and sensory or cognitive awareness. In all, 30% in the treatment group were rated by doctors as "very much improved" or "much improved" compared with 8% of those in the control group. Overall, 80% in the treatment group improved compared with 38% of controls. Study leader, Dr Dan Rossignol from the International Child Development Resource Centre, in Florida, said the use of hyperbaric therapy for autism has been gaining popularity in the US where parents can buy their own hyperbaric chamber if they have a spare $14-17,000. He said the findings would be quite controversial and he too was initially very sceptical of the idea but was prompted to do more research after the treatment showed benefits for his two sons who have autism. "We're certainly not talking about a cure, we're talking about improvements in behaviour, improving certain functions and quality of life. "The next step is to try to find out which kids do respond, because it's an expensive treatment - it may be that kids with more inflammation respond better. "It would also be nice to know how long the treatment lasts, and the finding needs to be confirmed." Richard Mills, research director at Research Autism, said this was the first well-designed study looking at the therapy. "We know this kind of therapy is useful in a number of neurological conditions and that's been well established. "What we don't know is how useful it is in autism, what we could be seeing is an improvement in other neurological conditions that go alongside autism. "We also don't know about long-term effects - it could be a transitory effect." Professor Philip James, an expert in hyperbaric medicine at the University of Dundee, said the pressure used was no more than that used to pressurise an aircraft cabin on the ground. He added that oxygen was the "controller of inflammation" but also had other effects on regulation of genes and tissue regeneration. But even if proven, the treatment may not be for everybody. "When you have any condition, there are people who have too much damage to get better." "All the oxygen is doing is bringing things towards normal." Want to know more about how HBOT can help with Austism? Click here to visit our case studies page for more information. Click here to watch our videos on Youtube. Hyperbaric oxygen therapy: Panacea or pure science fiction? A centuries-old medical concept may be one of the greatest medical discoveries you've never heard of - or at least not in the conventional sense. When some think of a "hyperbaric chamber," they think of that picture of Michael Jackson, twenty years ago, inhaling oxygen while sleeping in a clear cylinder. So is hyperbaric oxygen therapy a bizarre science fiction oddity or a medically proven treatment? As News 3's Sue Manteris and the Healthline Team dig deeper, you be the judge. 67-year-old Esther Mamon says it's a miracle she's alive. Two years ago she had a kidney transplant that her body rejected. Then six months later, she was stricken with skin cancer. "I had a little spot on my lip about the size of an eye of a needle and it grew to a golf ball." Doctors acted quickly to remove the rapidly growing tumor, treating it with chemotherapy and radiation. But within weeks, the cancer had spread to her jaw line. "The radiation burnt my chin down to my jawbone. And then they've been trying to reconstruct and fix it," she says. When her wounds wouldn't heal, Esther's doctor suggested hyperbaric oxygen therapy. "It was an easy decision to make in this case, that surgery alone wasn't enough and she needed the hyperbaric treatments to supply more oxygen to tissues and allow them to heal," explains Dr. John Menezes. Like many people, Ester had never heard of this form of therapy. "I was afraid. I was afraid of the unknown. They explained to me what it was but... unless you experience it, you have no idea." Now, Esther comes to University Medical Center for her daily hour-long treatments to increase the amount of oxygen in her blood. UMC Hospital has two hyperbaric chambers, one that can accommodate twelve patients at once and another that can hold three. During their treatments, patients inhale 100 percent pure oxygen. The air we normally breathe is 21 percent oxygen and mostly nitrogen. As the session progresses, the technician slowly increases the atmospheric pressure inside the chamber. Other than some fullness in the ears, Esther says the experience is painless. In fact, she often sleeps through it. After 13 treatments, she says she's seen a big improvement - and so has her doctor. "It allowed her to more rapidly heal, which means she's going to feel better about herself," says Dr. Menezes. "But she also describes subjectively having more energy with the hyperbaric treatments." 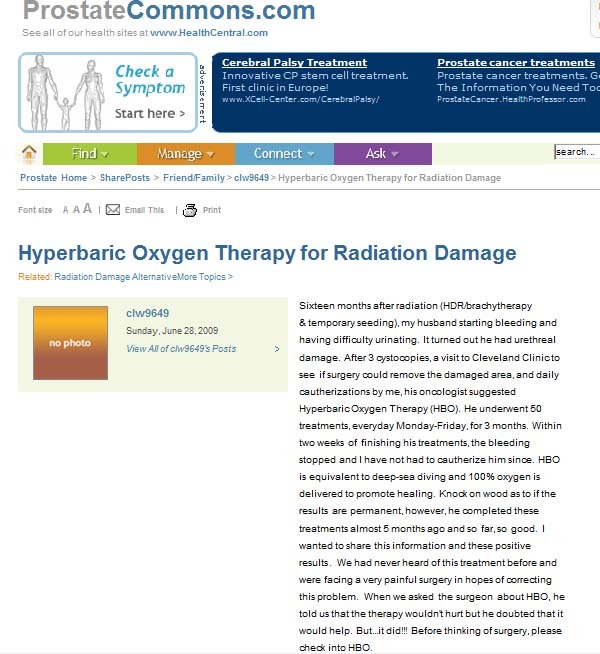 But while hyperbaric oxygen therapy may work wonders for patients like Esther, Dr. Menezes points out that for most of us, just increasing the percentage of oxygen you take in won't help much. "For a while, there was a kick on oxygen in bars and certainly Michael Jackson with his oxygen chamber. But if you're a healthy individual with normal lungs and normal oxygen delivery to your tissue, it's probably not going to be of benefit to you." Hyperbaric therapy has been used for decades on scuba divers stricken with decompression illness, also known as "the bends." The Food and Drug Administration has also approved the treatment for 13 conditions, including burns, wounds, and crash injuries. Insurance will usually cover the costs to treat these ailments. But the FDA has been reluctant to approve the therapy for many of the conditions that it's used for outside of the United States, such as autism, cerebral palsy, and multiple sclerosis. Paul Watts runs the hyperbaric chamber at Sunrise Hospital. He says that while more research is needed before hyperbaric oxygen therapy is approved for those conditions, he believes patients like Connie Lawson prove its healing potential. Lawson credits the therapy with saving her left foot after it was crushed in a forklift accident. "They were talking amputation. It was very swollen. It didn't even look like a foot." While some have doubts that a chamber filled with oxygen really has healing powers, these women have become true believers. Connie: What it did for me is just extraordinary and I would recommend it for anyone. Esther: When I came out of the hospital, I couldn't get up out of my chair without help. I couldn't do anything. And then after I started here every day, I got my strength back. Sue Manteris: So you, for one, do call it a miracle? Esther: Oh absolutely, absolutely. This is the best thing that's happened to me. In addition to the centers which are located in major hospitals, a number of private clinics throughout the valley now offer hyperbaric oxygen therapy. Many of them say they can help patients with conditions like autism and Alzheimer's. The FDA has not approved hyperbarics as a treatment for those conditions. Doctors have discovered breathing in pure oxygen can give people with wounds that won't heal a new lease of life. Hyperbaric oxygen therapy was seen as a last resort for those suffering from injuries that did not respond to treatment, but at a privately run clinic its success has meant it is gaining in popularity. After part of his leg was amputated four years ago, Malcolm Fleck was in agony and could hardly move. His stump was ulcerated and infected and as a last resort he tried hyperbaric oxygen therapy. "I had 11 operations in four years and this is getting rid of it where antibiotics and so-called well, modern medicine can't," Mr Fleck says. The technology has been used by divers suffering from the bends for decades, but now it is becoming an accepted part of mainstream medicine. Patients sit inside the chamber breathing pure oxygen through helmets under pressure. It is this combination that accelerates healing by up to 80 percent. With titanium implants inserted into her neck, Paparoa schoolteacher Audrey Campbell was in constant pain. She could not stand, let a long work. Having tried numerous treatments in the past she was cynical at first, but now she's a convert. "I wouldn't have believed it, it's a really positive experience," Ms Campbell says. Both patients are now breathing easy as the pain subsides and their recovery takes off. Scientists at Queensland University of Technology (QUT) (http://www.ihbi.qut.edu.au/) say new research they have conducted suggests that HBOT could prevent this from happening as the oxygen may help diabetics heal. Researchers say on a daily basis around 275 Australians develop type 2 diabetes and worldwide, every 30 seconds a person somewhere has a lower limb amputated because of diabetic foot disease. Scientists at Queensland University of Technology (QUT) say new research they have conducted suggests that oxygen treatment could prevent this from happening as the oxygen may help diabetics heal. 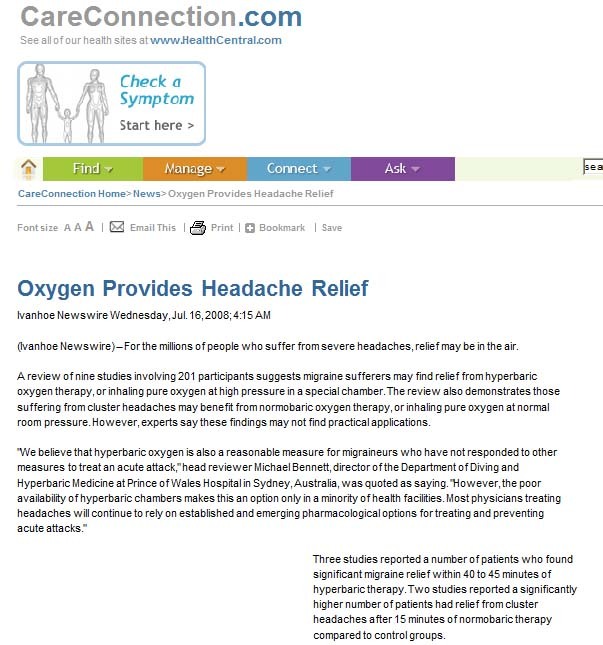 An international team of researchers led by mathematicians at QUT's Institute of Health and Biomedical Innovation at Kelvin Grove, modelled the use of hyperbaric oxygen therapy (HBOT) - HBOT is when the body is intermittently exposed to pure oxygen under pressure in order to heal the chronic wounds that lead to the need for amputation. QUT mathematician Jennifer Flegg says a small cut on the foot of a diabetic can have catastrophic effects because their wounds do not heal the same way as normal wounds because of many factors including reduced blood flow. Mrs Flegg says their modelling showed that HBOT applied intermittently under pressure to a diabetic wound speeds up the healing but only HBOT, and not oxygen applied with no extra pressure, stimulates healing of these chronic wounds. She says they also found that HBOT must be continued until the wound has completely healed in order for it to be effective and individual wounds need to be treated differently. Mrs Flegg says each patient has different healing capacities with HBOT and their modelling shows that there should be a research focus on individual treatment protocols in order to optimize the outcome for each patient. An article on the research by Mrs Flegg, Professor Ian Turner and Emeritus Professor Sean McElwain from QUT and Professor Helen Byrne from the Centre for Mathematical Medicine and Biology at the University of Nottingham will be published in the Public Library of Science (PLoS): Computational Biology.